The rural is not what it used to be. No longer simply a site for agricultural production for the city, the relationship between the rural and urban has become much more complex. Established categories such as rural /urban and village/city no longer hold true. Rural and urban conditions have become increasingly blurred, so how can we identify and distinguish their specific characteristics? Where is the rural, and what role does it play in an urbanised world? In developing countries the countryside is a volatile and contradictory landscape: legally designated rural areas look like dense slums; factories intersect fields and farmers no longer farm. In contrast, in developed regions, the rural has become a highly controlled landscape of production and consumption: industrialised agriculture coexists with leisure landscapes for tourism, retirement and recreation. 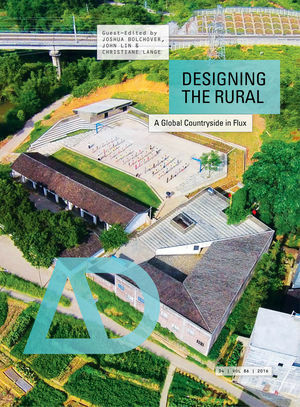 This issue of AD investigates how architects and researchers are critically engaging with the rural as an experimental field of exploration. Joshua Bolchover is an urban researcher, academic and architectural designer. He is an Assistant Professor at the University of Hong Kong. His research focuses on understanding urban transformation in China. He exhibited his work, ‘Rural Urban Ecology’ at the Venice Biennale 2010. He is the author with John Lin of Rural Urban Framework: Transforming the Chinese Countryside (Birkhauser), 2014. John Lin is an architect based in Hong Kong and currently an Assistant Professor at The University of Hong Kong. His current projects include the design of several school buildings, a village community centre, a hospital and a sustainable house prototype in China. He was the overall winner of the Architectural Review’s House Award in 2012 for his “House For All Seasons” a rural house in Shaanxi Province, China. Christiane Lange is a Visiting Assistant Professor at the Department of Architecture of the University of Hong Kong. She teaches Urban Design in the Bachelor and Master Program and works in the Community Project Workshop of the University of Hong Kong. Her research focuses on the urbanization process of developing countries.